Posted in General Health & Wellness on February 10, 2012. Last modified on February 01, 2018. Read disclaimer. 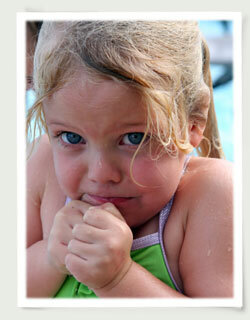 When swimming, at what water temperature might hypothermia become a concern? Water, even as warm as 79°F can lead to hypothermia if a person is submerged in it long enough. Factors other than water temperature that determine a person's chances of developing hypothermia in water include their body size and fat (large people retain heat better than do smaller people) and activity level. Unlike on land, where being active helps to increase circulation and warm the body, being active when a person is submerged in water causes a loss of body heat about 30% faster than if the person is stationary. When you go outdoors in very cold weather, what is the best way to dress? Dressing in multiple layers of loose-fitting clothes is optimal for cold weather comfort and survival. Air becomes trapped between the layers of loose clothing, which acts as an insulator. Another benefit of dressing in layers is that you're able to shed layers as they become wet (from sweat, rain or snow) or add or remove layers as the temperature fluctuates. The outer layer coat and boots should be roomy and water resistant. Inner layer clothing should be made of wool, polypropylene or silk (which are better at retaining heat when wet, or even wicking sweat away from the skin) than is cotton. Wear a warm cap that covers the ears, mittens (or gloves) and 2 or 3 pairs of socks. It is estimated that 30% of a person's body heat escapes from the head while extremities like fingers, toes, earlobes, chin and nose are usually the first to become cold and are most subject to frostbite. Take care to keep snow from entering inside mittens or boots. Which of these actions would be appropriate if you're treating someone for mild to moderate hypothermia? Warming the extremities first can draw circulation away from the body's core. Insulate them from the ground and provide shelter from wind and rain or snow. If possible, move them to warmth (even a campfire if that's all that's available). Replace wet clothing with dry ones, being sure to include their head, neck and extremities. Cover them with a vapor barrier such as tarp, garbage bags, etc. If the person is capable of swallowing, provide calorie-replacing, sugared drinks which will help fuel shivering, which is one way the body warms itself. Do not provide alcoholic or caffeinated beverages since these cause the body to lose heat even faster. You can apply warm (not hot), insulated rocks, canteen, hot water bottle or heating pad to areas where main arteries come close to skin surface such as chest, head, groin, neck, under both arm pits. Or use skin-to-skin contact inside a sleeping bag or loose fitting clothing. Do not, however, pair together two people who are both showing signs of hypothermia. Never immerse someone showing signs of hypothermia into a hot bath as this could cause a heart attack. If the person is dry, has consumed calorie replacement fluids and appears to be in stable condition for 30 minutes or more, encourage mild physical activity such as walking. The recommended treatment for persons with severe hypothermia differs somewhat. For instance, CPR may be required if the person has stopped breathing or has no pulse. For more details on treatment of severe hypothermia, you may want to refer to the State of Alaska Health and Social Services' Cold Injury Guidelines. love it! thanks 4 doing this! am going on a mountain hike tomorrow and needed info!